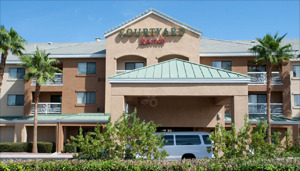 The Courtyard Marriot in Henderson is a good alternative to Las Vegas area hotels. It is located in a quieter setting off the Strip. Many guests like its affordable prices and the cleanliness of its rooms. The property is decorated in a contemporary style. Its housekeeping and front desk staff are courteous and helpful. The hotel is close to McCarran International Airport and all of the major activities of the Las Vegas Strip. It is within a convenient driving distance to Hoover Dam & Lake Mead, as well as hiking and biking trails and many outdoor activities. Restaurants, movie theaters, and some casinos are within walking distance. Hotel guests like its relaxing ambiance and easy check-in. Rooms are clean, quiet, and well furnished. They have a coffee maker, ergonomic desk & chair, and an LCD HDTV. The Courtyard Marriot has ample meeting space which includes a boardroom, other meeting rooms, and outdoor event space. High speed internet access is available. The hotel provides a shuttle to the Las Vegas Strip. A pool , fitness area, and laundry facilities are onsite. Hotel parking is adequate. Parking at the Courtyard Marriot can be more convenient than parking at some of the larger resorts on the Strip.